The “no camping” signs extend no less than 15 miles along 119 west of Boulder, well into the national forest. I finally found a pull-out near an artificial lake that didn’t have any obvious signs. I’m not sure if it was legal or not, but it should have been. It’s not like my parking overnight and peeing on a bush bothers anyone, but I suppose the Boulderites pay good money to keep the rabble out. 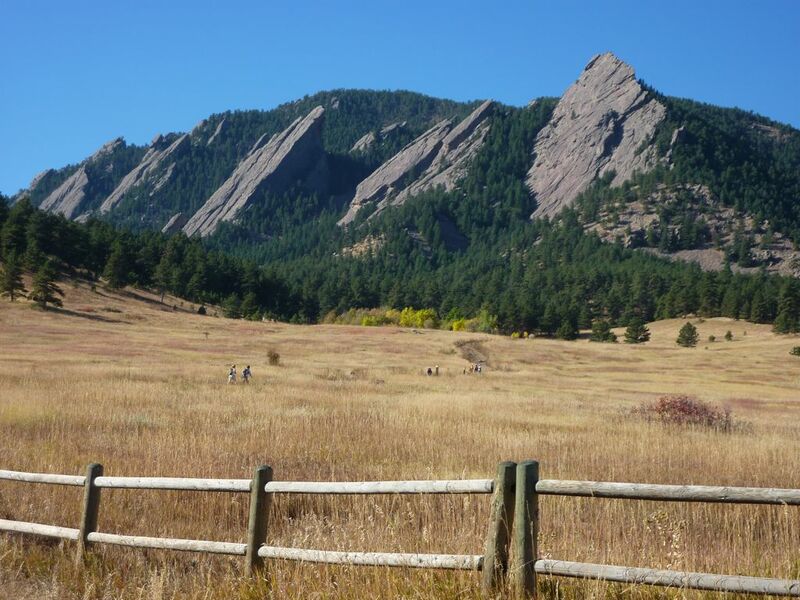 Anyways, I mosied over to Chautauqua Park to climb some slightly more challenging routes on the popular first and second flatirons. First up was the second, the least popular of the three. This one isn’t as distinct as the others, with several broad, tree-filled gullies splitting it and allowing an easy escape or rest. Mountain Project recommended 3 routes: Freeway and Dodge Block, both 5.0, and Free For All, with a couple 5.6 moves. I found all but the top “Pullman Car” block easy enough that I could climb pretty much anywhere, so I’m not sure I actually did the two 5.0 routes, or the first part of FFA. The most challenging part of the first two routes was actually going up and down the west side of the summit block, which has great holds, but is vertical in places. While I comfortably did the first two routes in running shoes, I donned my painful climbing shoes for the third. FFA is mostly mellow until the gully left of and below the summit block, where it steepens somewhat and goes through some poison ivy. After wasting time wandering around the overhanging block south of the ravine, I made my way north up the crux (a mantle that might have been 5.6) onto the summit block, then had an enjoyable scramble to the summit. While resting and eating, I watched a soloist on the first flatiron, and several parties on the third, including one on the gnarly, overhanging west side. After lunch, it was time for some moderate climbing on the first flatiron. Instead of the classic direct route, I climbed the easier north part of the east face (5.3), then followed the north arete (5.4). I stuck with running shoes, and while I regretted this choice near the bolt partway up the east face, I topped out without too much flailing. From there it was a fine, sustained climb along the arete: interesting but not scary, with great views of the snow-covered front range. The downclimb off the southwest side was steep, but with plenty of positive holds. This is an excellent solo — I highly recommend it. Start of some 2nd flatiron routes. West side of 2nd flatiron; short but steep. In the upper gully on Free For All, above some poison ivy. Soloist on the classic 1st flatiron route. Front range from 1st flatiron.